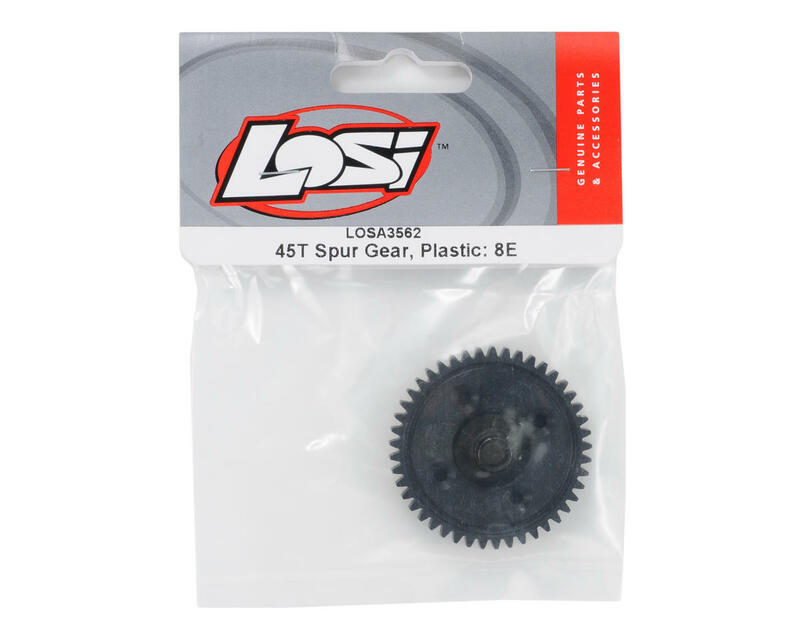 This Losi Mod 1 Plastic Spur Gear is intended for use with the Losi 8IGHT-E series vehicles. 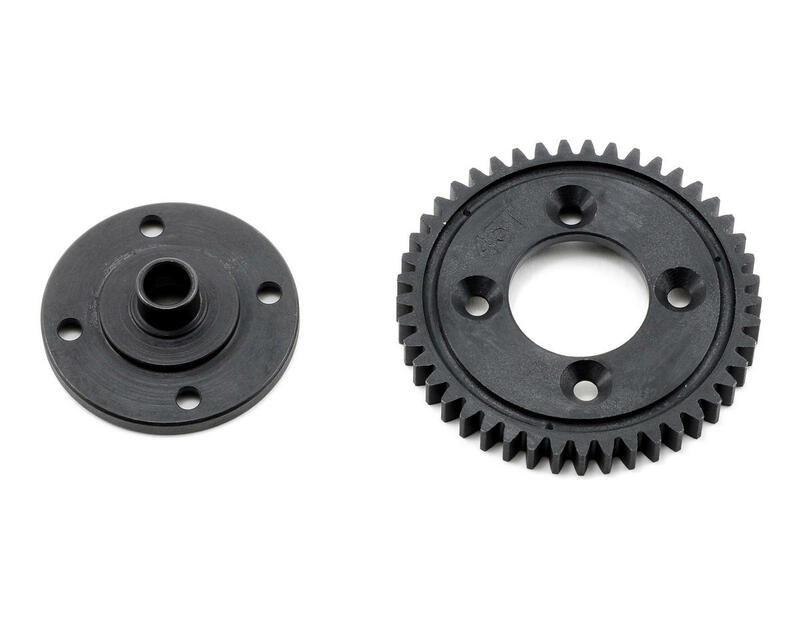 These spur gears are made of highly durable plastic that has been specifically designed for the rigors of 1/8-scale electric buggy and truggy racing. Plastic Spur Gears help to make the car quieter, but require a more precise mesh setting. Spur gear includes a steel insert for improved overall strength and longevity, and the steel insert stays on the center differential when the spur gear is removed, allowing you to change your spur gear quickly and easily. I run one of these in my 8T 2.0, plus I have adapted 2 others in a muggy and Xray and I am yet to strip a single spur. As said before it all about mesh and also quality of pinion. The Muggy has a 1717 in it and the 8T has a 1520 so the spur can handle some serious power, just get the mesh right. The old fashioned Paper trick works well and always remember after it’s all tightened down you should be able to feel just a hair of play between the pinion and spur too much play and it will strip; no play and you will grind the teeth on the spur also causing it to eventually strip. These work great in buggies and last a long time if meshed correctly. I have run them in my 8ight and RC8 (Losi center diff) with no trouble. Saves wear and tear on pinions and run nice and quiet. Do NOT work with old school Tekno motor mounts or any mount where the motor is not mounted directly to the center diff bulkhead. Works well for me, Running a Castle 2200KV in a E 3.0 on 4S, Shows signs of wear and tear from being exposed, but still works fine. As long as the mesh is good, this gear should last awhile. Plastic is weak and will strip out when you least expect it. Pretty standard on the 8ight-e to replace the plastic spur with the metal one. Not sure why Losi doesn't improve the quality of the plastic other than the fact that they want to sell the $20+ metal spur. Two of us ran the new Losi 3.0 truggies today with plastic gears and they were both stripped within a couple of races...I ran the metal gear in a 2.0 8E truggy all last year and never had a problem. I'm going back to the metal one! These are absolutely fine if you can set the mesh properly and know how to drive like you are running a plastic spur. I have been running this in my 8ight-e 2.0 buggy for almost two years and I'm just replacing my first one. I did have problems in my Tekno conversion on my truggy, but now I have the Losi 8ight-t 2.0 conversion and it has run for 3 months just fine. Learning how to mess gears make them last longer. Not completely sure this is designed for the truggy, spur was toast after a few minutes, running a 2200kv, now have a 1800kv, that eats metal ones, wondering if there is some kind of riser to adapt to the plastic, would be nice. Strange b/c the 8ight-e seems to work fine with plastic. Not strong enough for torqy neu-castle 1800kv motors in my 8ight B brushless conversion.. Had two of them shaved in just a few laps. Always go with the steel ones, louder but stronger.